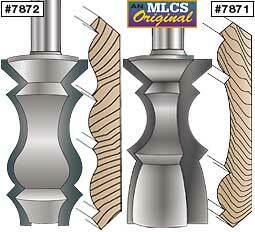 Make classic cove casework molding These 2 flute carbide tipped bits make the classic cove molding, popular in many home and casework projects. The elegant design is made easily and safely on the router table, using featherboards and push blocks to feed the work against the fence. Available in 3 different sizes for diverse projects - ranging from an armoire to your house trim. 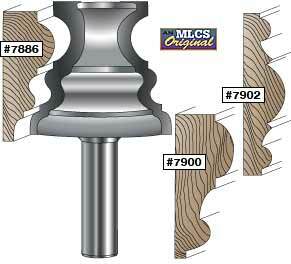 I purchased the 2.75" bit to make some molding for bedroom furniture I am making. Using soft maple, I fed the board slow with the router running about 2/3 speed and it came out very nice. It took only one pass with the maple. Very smooth cut required very little sanding. Much better than the table saw angle technique. Great for baseboards and doors. 2 flute, carbide tipped with fully enclosed ball bearing guides. Great for baseboards, chair rails, door casings, as well as picture frames and cabinet moldings. 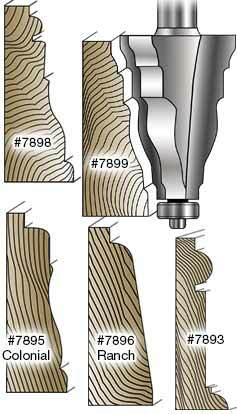 #7896 is a "Ranch Profile Casing Molding Router Bit". 2 flute, carbide tipped. 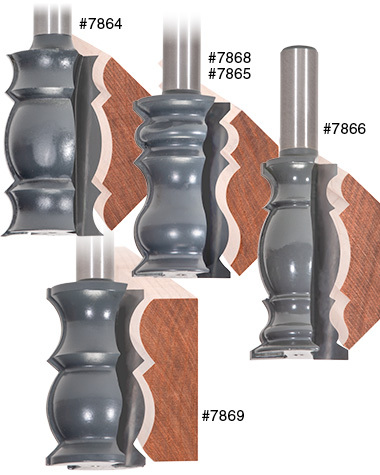 Make large 4-7/8" crown moldings, chair moldings or decorative moldings with your 1/2" router. Use in 1/2" table mounted router. Cut off 45° excess. It is a pretty good bit. I think it would be better as a triple wing cutter. I tried everything to make it a smoother cut. Just too much sanding involved after making 6 passes to reach the final cut. Not cost effective for oak trim but would be for walnut or cherry. Definitely can't buy trim that looks as nice as the outcome. WEB SPECIAL! Save $10! 2 flute, carbide tipped with fully enclosed ball bearing guide. 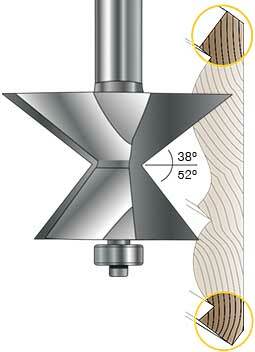 Now, it is easier than ever to create a 52º/38º bevel angle on your crown and cornice molding. 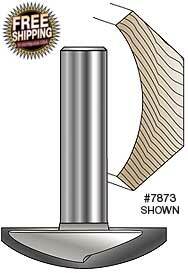 Quickly and easily adjust your router table fence with the ball bearing guide. Run one edge face-up and the opposite edge face-down to create the opposing angles. Makes top and bottom bevel cuts shown on profile at right. (Bit 7882). The first time I used this bit it certainly was a life-saver. I was wondering how I was going to make the bevel cuts on a piece of wood that I made my router cuts on for a molding when I saw this bit in the MLCS catalog. It is a great asset to my router bit collection. The video is also great. Thanks MLCS! 2 flute, carbide tipped. Great for making chair rail moldings with a table mounted router. Also use for making base caps, cabinetry trim molding, panel molding and picture frames. I like to see these kind of video for help me learn how to use the router bits. very informative. WEB SPECIAL #1713! Save $5! 2 flute, carbide tipped. Make decorative crown moldings. Use in a 1/2" table mounted router. Make multiple passes by using a fence. Cut off 45° excess. Also used for decorative picture and mirror frames, and decorative edges on clock faces. 1/2" shank. I bought the #7864 two months ago; ran about 10 feet of stock and very pleased how it looks the profile is nice and I was able to cut the first bead of a make a nice cove piece for a smaller cabinet. I was happy with price I would buy again.